I started my visit to Keelung’s most famous historical site, Ershawan Fort (二砂灣砲台). It’s perched on a strategic mountain guarding Keelung Harbor and in 1841 repelled the British for three straight years and the French for a few more after that. 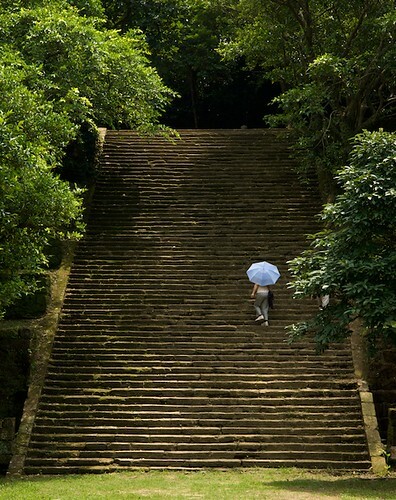 The main staircase accessing the military camp site at Ershawan Fort (二砂灣砲台) Keelung, Taiwan (台灣基隆市). 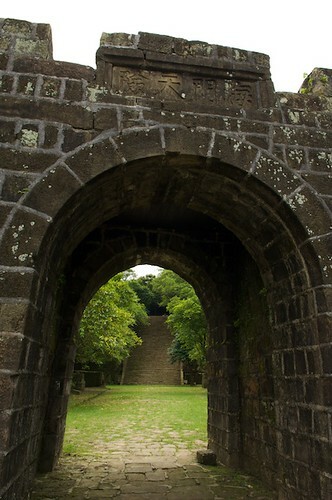 The main entrance to the military camp site at Ershawan Fort (二砂灣砲台) in Keelung, Taiwan (台灣基隆市). My next stop was the amazing Hoping Island (和平島). It’s an beautiful coastal park with other-world like rock formations. 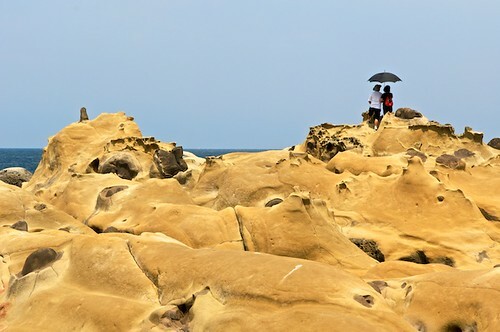 Often passed by by tourist on their way to the more famous Yehliu, Hoping Island is a geologist’s dream-scape of strange rock formations. 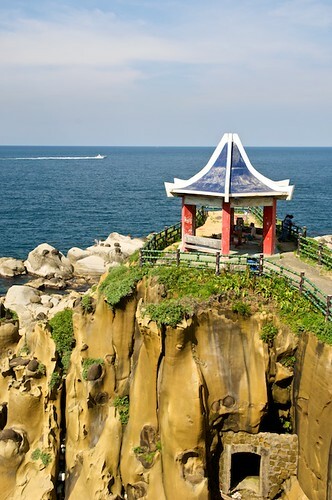 Hoping Island (和平島) is an amazing coastal park in Keelung, Taiwan (台灣基隆市). It has some very interesting geology and beautiful views of the Pacific Ocean. 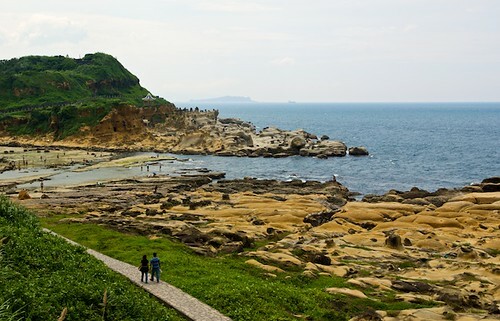 Fairly untouched by developers, Hoping Island (和平島) allows visitors to walk around on the rocks anywhere they want. 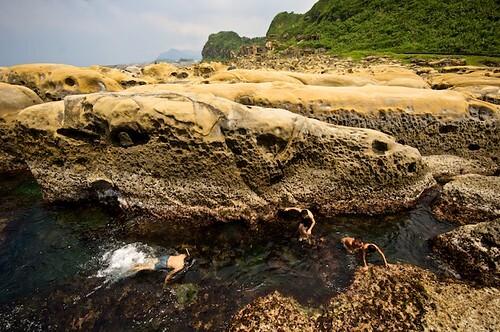 Hoping Island (和平島) in Keelung, Taiwan (台灣基隆市) even allows visitors to swim in the tidal pools. My last stop of the day was Miaokou Night Market (廟口夜市), in downtown Keelung. 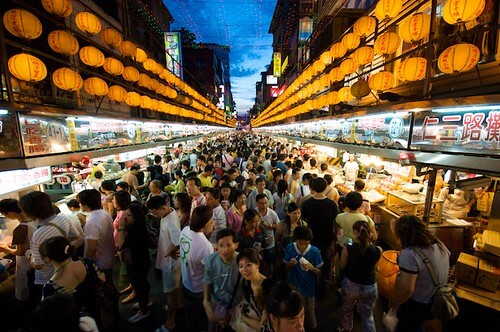 It’s a very busy night market filled with local foods and delicacies. A welcoming (and rare for Taiwan) feature of this night market is that many of the menus are in English. Ok, so ALL the signs aren't in English... but the people are really friendly! Miaokou Night Market (廟口夜市) Keelung, Taiwan (台灣基隆市). My last stop was the Dian Ji Temple, at the entrance of the night market. 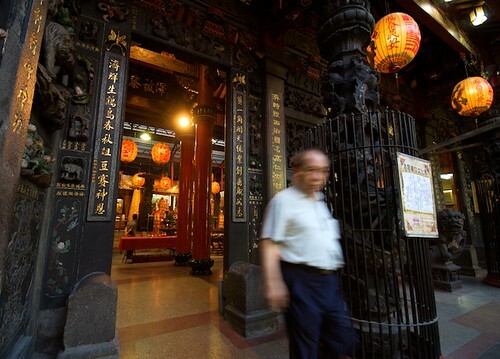 A typical but beautiful Taiwanese temple, its stone carved dragons and tigers spend their days feasting their eyes on the market’s food stalls. 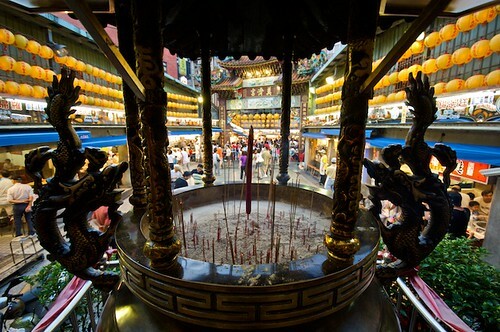 The Dian Ji Temple sits at the entrance to Miaokou Night Market (廟口夜市) in Keelung, Taiwan (台灣基隆市). Nice work Neil. 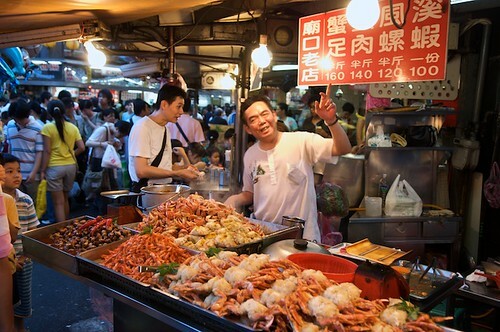 I’ve only ever been to the night market in Keelung. I’ll have to get up there and do some exploring this summer. I particularly like the photo of the stairs to the fort. Wonderful photos. The weather during the Photo Club’s recent visit wasn’t very good. I’d also like to go back again and visit the forts. Thanks David. I forgot to mention that that’s what inspired me to dig up these pictures! Looks great! I’ll have to head up there soon! Looks brilliant. I was there a few times, took a bunch of photo, none of them came close to yours. The photos look great. I thought Keelung was quite nice and friendly when I was up there a couple nights back. The night market has quite a few treats to offer as well. Any ideas on taking the ferry to Japan? Thanks. Last I heard, that ferry didn’t run any more. But I could be wrong. Your photos are all terrific, but what brought me running was the first one of the night market. What a killer shot! 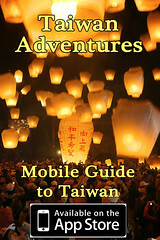 You’re set to be a featured photographer on Taiwan Photographers in a few weeks.